After the Civil War, Congress charged the War Department with the job of reburying dead Union soldiers. The grim task of reburying over 300,000 Union casualties of the war fell to the War Department’s Quartermaster’s Department. Bivouac of the Dead is the story of the struggle to identify and reinter as many Union victims of the war as possible. (The Federal Government never tried to bury the Confederate dead.) 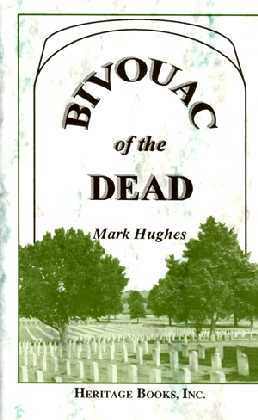 The first published history of the creation of the National Cemetery System, Bivouac of the Dead tells of the successes and failures (only about 54% of the Union bodies were ever identified) of the reburial teams. Bivouac of the Dead offers the first published proof that the War Department lied about the number of Union POW’s who died in the Salisbury, North Carolina, Prison Camp. In 1873 Congress allocated funds for a monument to the “11,700 Soldiers” who died at the Salisbury Prison. However the War Department suppressed the burial register that listed the names of the 3,504 Union soldiers who actually died at Salisbury. During research for Bivouac, Hughes found the a copy of the original burial roster. Bivouac of the Dead also contains the story of B.B. Dykes, the owner of the land where the notorious Andersonville Prison Camp was built. In 1865 Dykes’ land was appropriated for a National Cemetery. Even though 13,712 burials were made there, Dykes was not paid for his land until 1875, and then only after he threatened to plow up the cemetery and “plant a vineyard” because “Dead Yankees would make good wine”. Shortly after this threat, Dykes was paid for his land. For the genealogist, Bivouac of the Dead offers information on over 2,400 burial sites of Federal soldiers during the Civil and Indian Wars. This is the only published aid to finding the gravesite of an unknown Federal soldier. Bivouac of the Dead contains the first published index to the War Department’s official listing of Union burials, the 27 volume Roll of Honor series. The title, Bivouac of the Dead, was taken from a poem written by Theodore O’Hara. Autographed copies of Bivouac of the Dead are available from the author for $30.50 plus $3.50 for shipping via first class mail. In 1865 the U.S. Quartermaster’s Department published the first volume of the Roll of Honor series, a work designed to commemorate the Union dead in the Civil war. By 1871, when the twenty-seventh and final volume was published, the series had named over 228,000 Union soldiers who were buried in national cemeteries, post cemeteries, soldier’s lots, and private cemeteries. But astonishingly, the Roll of Honor was incomplete, and for 130 years it remained incomplete and all but forgotten. Now, however the twenty-seven volumes have been reprinted (and indexed) and, thanks to Mark Hughes, who has uncovered additional burials, the series has finally been completed. This Unpublished Roll of Honor is based largely on materials Mr. Hughes discovered at the National Archives, including records of national cemeteries omitted from the original series, records of headstone requests (often for soldiers who were buried in private cemeteries), and records of post cemeteries that eluded the original compilers. All told, something like 8,500 men are listed here with (usually) their rank, company, and unit. The data is arranged by state and therein alphabetically by cemetery, and all names are conveniently listed in the index. Following the lead of the original Roll of Honor, this work also includes the names of soldiers who were buried in post cemeteries on the western frontier, and it sometimes lists the names of civilians who were buried in post cemeteries–usually soldiers’ wives or children. For institutions and individuals who own copies of the original Roll and the new Index, this is a “must buy” companion volume. The Unpublished Roll of Honor contains 341 pages, including a name index. The book is cloth bound.